This year’s symposium focuses on fascinating tales of plant exploration around the world, from the time of the founding of our nation through the present day. For centuries, people have searched for new food, medicine, and aesthetic delights in the plant world. Some, like John Bartram, enjoyed long, successful careers botanizing in the new world, while David Douglas, for whom the Douglas fir is named, was lost in mysterious circumstances in Hawaii at a young age, and E.H. Wilson, best known for finding the Davidia involucata, or handkerchief tree, sent back many thousands of new plants from Asia to his patrons in Europe and America that we still happily grow in our gardens. 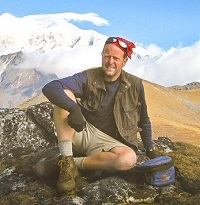 Today, legendary adventurers like Dan Hinkley, our keynote speaker, continue to risk life and limb (or at least a bandana) in pursuit of new botanical gems from Vietnam, Chile, and elsewhere that add diversity and a ‘wow’ factor to our own landscapes. Presentations will cover: a short history of the evolution of plants and some surprising new discoveries; Lewis & Clark’s historic Western expedition; the awe-inspiring first public botanical garden in America, now hidden beneath Rockefeller Center in New York City; a plant breeder’s latest plant discoveries from as close as Virginia and as far away as Myanmar. Dan Hinkley is an internationally known plant hunter, author, and former owner of the Heronswood Nursery in Washington state. (Many of you probably still have copies of that catalogue!) Dan will share his plant hunting adventures and plant discoveries from around the world, focusing on finds most suitable for Mid-Atlantic gardens. Click here for more information about our speakers. Our 23rd annual March symposium offers a full day of great horticulture information for both novice and seasoned gardeners. Besides a day of great speakers, there will be shopping opportunities with local growers and other special vendors, plus an extensive silent auction with lots of unique garden-related books, plants, and tools. Come celebrate the end of winter with a group of like- minded plant geeks from the tristate area. We have state- of-the-art facilities at the DCCC campus, which is set in a beautiful arboreal landscape in Media PA. Please note that credit cards will be accepted by HPS/ MAG, but may not be accepted by all vendors, who will appreciate cash or a check. A complete list of vendors will be available on our website in March. Register AND pay online with a credit card to receive a special credit to use for the Silent Auction.